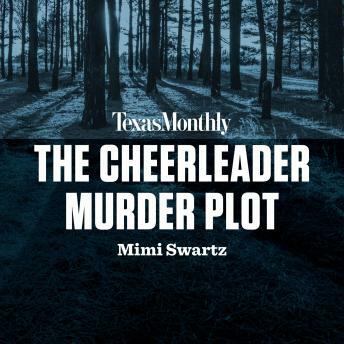 In partnership with Texas Monthly, Mimi Swartz's 'The Cheerleader Murder Plot' is now available as an audio download, where the length and timeliness of a podcast meets the high-quality production of a full-length audio program. In 'The Cheerleader Murder Plot,' Mimi Swartz paints a scene of a place that makes the unthinkable -- the plot to murder a fellow cheerleading mother and her daughter -- something within the realm of possibility. To say Channelview is a dismal place is an understatement. It's the kind of place where even the slightest bit of distinction goes a long way amidst the usual doldrum of high school, marriage, kids, repeat. It's within this setting that the likes of obsessive, helicopter moms Wanda Holloway and Verna Heath, who live vicariously through their daughters, are given terrifying credence. When both mothers campaigned for their daughters to make the junior high cheerleading squad and only Verna succeeded, Wanda quickly turned what could have been friendly competition into a heated, lethal rivalry. Her scheme to permanently rid the competition standing in the way of her daughter's success -- and more importantly, her own -- stabs at the heart of the myth of the cheerleader in Texas and the suffocation of a forgettable, small town.